Barry Bannan wheels away in celebration after his fine volley. When Wednesday played Millwall at the New Den six months ago, Jos Luhukay got his team selection wrong. The Dutchman fielded no recognised striker in the capital, with Atdhe Nuhiu and Lucas Joao starting on the bench as he utilised Ross Wallace as a false nine. Liam Palmer congratulates Barry Bannan after his opener. Luhukay's controversial decision backfired as his Owls team squandered a one-goal lead and slipped to a 2-1 defeat. 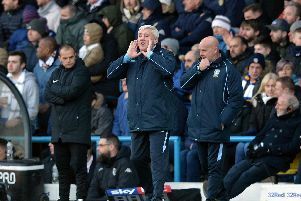 He made another big call against the same opponents at Hillsborough last night, dropping senior stars Sam Hutchinson, Fernando Forestieri and Atdhe Nuhiu to the substitutes bench. Youngsters Matt Penney and Fraser Preston were handed their first Wednesday starts as Luhukay made five changes to his starting line-up. It was a brave, risky decision which would have left Luhukay open for criticism if Wednesday failed to perform again and pick up a positive result. But Luhukay's selection gamble paid off...big style. Jordan Thorniley beats Steve Morison to the ball. Goals either side of half-time from midfield dynamo Barry Bannan and skipper Tom Lees helped the Owls secure their first league win of the season. Ryan Tunnicliffe's 72nd minute strike set up a grand-stand finish but the Owls dug deep to grind out the three points. A huge roar greeted the final whistle and the result eased the pressure which was threatening to mount on Luhukay after a slow start to the 2018/19 campaign. Penney and Preston fully vindicated Luhukay's decision to play them from the start. The pair made impressive contributions, giving the Owls extra pace and energy both in defence and attack. Preston was given a richly deserved standing ovation when withdrawn in the closing stages of the contest. Jordan Thorniley also delivered a mature, strong performance alongside Lees while Bannan ran the show in midfield. Wednesday were boosted by the news that key midfielder Adam Reach was fit enough to start, having shrugged of a knee injury. As well as bringing in Penney, Preston and Reach, Luhukay also handed recalls to Liam Palmer and Steven Fletcher. Ash Baker and the injured Daniel Pudil, who picked up a knock at Brentford last week, missed out. There was an early statement of intent from the Owls as Fletcher sent a weak header into the arms of Jordan Archer following a good move involving Bannan and Marco Matias. After Thorniley, deployed in his natural position at centre-half, snuffed out a dangerous Millwall attack, Preston combined neatly with Fletcher but his pull back evaded everyone in the centre. Bannan's first goal in over a year was well worth the wait. Millwall only half cleared Adam Reach's dangerous cross from the left and Bannan drilled in a stunning 25 yard volley from the edge of the penalty area which went in off the underside of the crossbar. It was a sensational strike and lifted the mood inside Hillsborough. Luhukay said in the build-up he wanted his senior players to take more responsibility. Bannan answered his manager's call. Preston was a lively presence down the right flank in Wednesday's 4-3-3 system. After nodding over Joey Pelupessy's corner, the talented wide man tried his luck from long range but his speculative attempt flew over the top. Bannan, the Owls' creative spark, fed Pelupessy, whose 30 yard strike drifted agonisingly over. After a tentative start, Millwall grew into the contest as the first half wore on. There were times when the Lions, who exceeded all expectations by finishing eighth last term, broke forward in but their final ball let them down. At one point, Neil Harris's well-drilled side had a six on three attack as Wednesday's defence lived dangerously. However, Jed Wallace over hit his cross to the back post and the chance was gone. Bannan, pulling the strings in the middle of the park, came close to grabbing a second in the 36th minute. His rasping shot from distance was deflected behind for a corner. The closest the Lions came to restoring parity was a Shaun Hutchinson header at the back post which went off target after a Jed Wallace corner. It was no surprise Bannan had a hand in Wednesday's second goal less than a minute into the second half. His free from from the left was not dealt with by Millwall's defence and Lees pounced, poking the ball past Archer at the back post. The relief inside Hillsborough was tangible. With 18 minutes remaining, Lees turned from hero to villain. The defender's poor back header was seized upon by Lee Gregory and his low delivery was tapped in by Tunnicliffe. The introduction of Tom Elliott and Jiri Skalak had sparked Millwall into life. Skalak's 30 yard shot went just wide before striker Elliott's volley flew over the bar as the Lions enjoyed a good spell of pressure. But Wednesday weathered the storm and almost bagged a third. Forestieri fired into the side-netting from an acute angle after a fine through ball by Bannan. Then Nuhiu, on the stretch, stabbed over after another superb Bannan centre. Millwall threw everything at the Owls late on in a thrilling finish, with Palmer clearing James Meredith's overhead kick off the line before Cameron Dawson produced a vital stop to keep out Gregory's follow up. Dawson was also equal to Skalak's low volley as Wednesday survived a late Millwall onslaught to extend their unbeaten home league run against the Lions to five matches. It was a much-improved Owls display packed full of character, grit and determination. Owls: Dawson; Palmer, Lees, Thorniley, Penney; Bannan, Pelupessy, Reach; Preston (Boyd 79), Matias (Forestieri 70), Fletcher (Nuhiu 69). Substitutes: Wildsmith, Fox, J Lee, Hutchinson. Millwall: Archer; Romeo (McLaughlin HT), S Hutchinson, Cooper, Meredith; J Wallace, Tunnicliffe, Saville, O'Brien (Skalak 61); Gregory, Morison (Elliott 61). Substitutes: Amos, Onyedinma, Ferguson, M Wallace.